The Flood Of Syrian Refugees Puts ISIS On The Defensive : Parallels The Islamic State claims it's building a caliphate that welcomes true Muslims. But Syrian refugees, as well as those displaced inside the country, are sending a very different message as they flee. A Syrian refugee woman walks to the ferry Eleftherios Venizelos, which functions as a registration center and accommodation for migrants and refugees on the Greek island of Kos, on Aug. 17. The Islamic State has released multiple videos calling on refugees to return to Syria. As more Syrian refugees board rickety boats on the Turkish coast, the Islamic State is cranking up its propaganda campaign. The refugee crisis is also becoming a crisis for ISIS, as Syrians reject the group's claim that the so-called caliphate offers a safe haven, and the refugees instead opt for the dangerous journey to Europe. In recent weeks, ISIS has put out almost a dozen videos with messages that denounce the refugees, threaten them with the horrors of living among "unbelievers" and plead with them to join the caliphate. "The idea that they are not heading to 'ISIS land' is a slap in the face," says Alberto Fernandez, who ran the State Department's counterterrorism communications unit before recently joining the Middle East Media Research Institute, or MEMRI. "They are leaving because their relatives were killed by Assad," he says of the refugees. 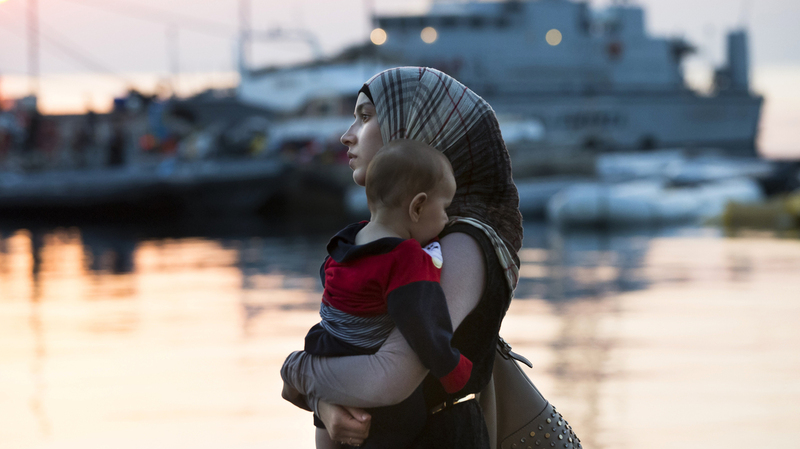 "That's the ISIS demographic, but the people brutalized by Assad are not turning to ISIS." And that has rattled the group, according to Fernandez. The media coverage of the refugee exodus is impossible to ignore even in areas under ISIS control, he notes. "You can't avoid heart-wrenching pictures of people going West," he adds. It is an affront to the basic ISIS ideology, he says, for a militant group that believes it is a sin for Muslims to live in inclusive Western societies. For these ideological militants, "real Muslims" must become part of ISIS, and "if you are trapped in the West, go kill someone," says Fernandez, describing the basic message of the Islamic State. The rejection by so many Syrians has prompted ISIS to try to counter the narrative. The titles reflect "the group's confusion as to how to exploit the issue, or at least limit the damage to its image," according to the Soufan Group's most recent report. 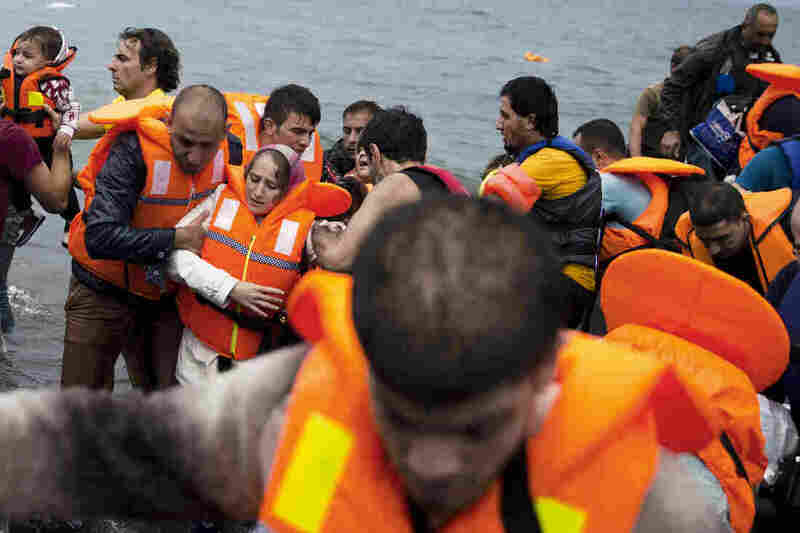 Syrian refugees arrive on the Greek island of Lesbos after crossing the Aegean Sea from Turkey on Tuesday. "This is very unusual, in terms of so many on one topic in a short time frame," says Aymenn Jawad Al-Tamimi, an analyst at the Middle East Forum, a think tank based in the U.S.
Tamimi says one reason for this propaganda barrage is ISIS wants to get back into the media spotlight, but "they also want to counter the idea that they are responsible for the crisis." The overwhelming rejection of the caliphate is a serious blow, says Aron Lund, editor of Syria in Crisis, a website published by the Carnegie Endowment for International Peace. "It considers itself a caliphate and the only legitimate Islamic government," says Lund. The majority of Sunni Muslims who oppose President Bashar Assad's regime also reject the ISIS hard-line ideology. No amount of propaganda videos can counter the image of desperate Syrian families on the move with their children, willing to sacrifice everything on the gamble for a better future in Europe. "If you look at the people who have left Syria in the past few years, it's the best people," says Fernandez. These are people who aspire to a middle-class life." More than 4 million Syrians have fled the country since the war began in 2011 and nearly 8 million are displaced inside the country. Together, these 12 million Syrians account for more than half of the country's prewar population of about 23 million. "It is an emptying of the best elements, the people who are the dreamers. The middle is being emptied out," Fernandez says.